The Tour de France (French for Tour of France), often referred to as La Grande Boucle, Le Tour or The Tour, is an epic long distance road bicycle racing competition for professionals held over three weeks in July in and around France. It has been held annually since 1903, interrupted only by World War I and World War II. The most recent Tour was the 2005 Tour de France. The Tour de France is by far the most prestigious of all cycling competitions in the world. While the other two European Grand Tours are well-known in Europe and attract many professional cyclists, they are relatively unknown outside the continent, and even the UCI World Cycling Championship is only familiar to cycling enthusiasts. The Tour de France, in contrast, has long been a household name around the globe, even amongst people who are not generally interested in pro cycling, and is for cycling what the FIFA World Cup is to football in terms of global popularity. Only the best cyclists in the world are chosen to compete and competitors must have an invitation to enter the race. It is also the world's largest annual pro sporting event, measured in the number of viewers. The Tour was founded as a publicity event for the newspaper L'Auto (ancestor of the present l'Équipe) by its editor and co-founder, Henri Desgrange, to rival the Paris-Brest et retour ride (sponsored by Le Petit Journal), and Bordeaux-Paris. The idea for a round-France stage race is also credited to one of his journalists, Géorges Lefèvre, with whom Desgrange had lunch at the Café de Madrid in Paris on 20 November 1902. L'Auto announced the race on January 19, 1903.Promotion of the Tour de France certainly proved a great success for the newspaper; circulation leapt from 25,000 before the 1903 Tour to 65,000 after it; in 1908 the race boosted circulation past a quarter of a million, and during the 1923 Tour it was selling 500,000 copies a day. The record circulation claimed by Desgrange was 854,000, achieved during the 1933 Tour. Today, the Tour is organised by the Société du Tour de France, a subsidiary of Amaury Sport Organisation (ASO), which is part of the media group that owns l'Équipe. The Tour is a "stage race", divided into a number of stages, each being a race held over one day. The amount of time it takes each rider to complete each stage is noted, recorded and accumulated. The ranking of the riders according to accumulated time is known as the General Classification, or GC. The overall winner is the one who is ranked first on GC at the end of the final stage. It is possible to win the overall race without winning any individual stages (which Greg LeMond did in 1990). Winning a Tour de France stage is considered a great pro cycling achievement, more prestigious than winning most single day races, regardless of one's overall standing in the GC. Although the number of stages has varied in the past, recently the Tour has consisted of about 20 stages, with a total length of between 3,000 and 4,000 km (1800 to 2500 mi). In addition to the race for the overall win, there are several additional competitions. The leaders of these competitions are represented by certain coloured jerseys; see below for more information. Most stages take place in France though it is very common to have a few stages in nearby countries, such as Italy, Spain, Switzerland, Belgium, Luxembourg and Germany as well as non-neighbouring countries such as the Republic of Ireland, United Kingdom (visited in 1974 and 1994) and the Netherlands. The three weeks usually includes two rest days, which are sometimes used to transport the riders long distances between stages. Other major stage races include the Giro d'Italia (Tour of Italy) and the Vuelta a España (Tour of Spain). The Giro d'Italia, Tour de France and World Cycling Championship constitute the Triple Crown of Cycling. Since 1984 there is a Tour de France for women, La Grande Boucle Féminine Internationale or simply Le Tour Féminin. Generally a colored jersey is associated with each prize. The current holder of the prize is required to wear the jersey when racing. If a single rider is entitled to wear more than one jersey (for example, both overall leader and King of the Mountains), he wears the most prestigious one with the second place holder in the category wearing the other. The maillot jaune (yellow jersey), worn by the overall time leader, is most prized. It is awarded by calculating the total combined race time up to that point for each rider. The rider with the lowest total time is the leader, and at the end of the event is declared the overall winner of the Tour. Desgrange added the yellow jersey in 1919 because he wanted the race leader to wear something distinctive and because the pages of his magazine, L'Auto, were yellow. Additional time bonuses, in the form of a number of seconds to be deducted from the rider's overall time, are available to the first 3 riders to finish the stage or cross an intermediate sprint (see below). As of 2005, the first 3 places to finish are awarded bonuses of 20, 12 and 8 seconds respectively, while the first 3 places at intermediate sprints are awarded 6, 4 and 2 seconds. However, these bonuses are rarely significant enough to cause major upset in the classement géneral (general classification). The colour of the leader's jersey was originally a reference to the newspaper which sponsored the race, which had yellow pages. The "King of the Mountains" wears a white jersey with red dots (maillot à pois rouges), referred to as the "polka dot jersey". At the top of each climb in the Tour, there are points for the riders who are first over the top. The climbs are divided into categories from 1 (most difficult) to 4 (least difficult) based on their difficulty, measured as a function of their steepness and length. A fifth category, called Hors categorie (outside category) is formed by mountains even more difficult than those of the first category. In 2004, the scoring system was changed such that the first rider over a fourth category climb was awarded 3 points while the first to complete a hors category climb would win 20 points. Further points over a fourth category climb are only for the top three places while on a hors category climb the top ten riders are rewarded. Additionally beginning in 2004, points scored on the final climb of the day were doubled if said climb was at least a second category climb. Two lesser classifications are that for the maillot blanc (white jersey), which is like the yellow jersey, but only open for young riders (those who are less than 25 years old on January 1 of the year the Tour is ridden), and that for the "fighting spirit" award which goes to the most combative rider. Each day, a group of judges awards points to riders who made particularly attacking moves that day. The rider with most points in total gets a white-on-red (instead of a black-on-white) identification number. Finally, there is a team classification. For this classification, the time of the first three riders from each team is added after each stage. The Tour currently has 21 teams of 9 riders each (when starting), each sponsored by one or more companies - although at some stages of its history, the teams have been divided instead by nationality. The team classification is not associated with a particular jersey design. The rider leading a classification at the end of a stage is required to wear the corresponding jersey during the next stage. Jerseys are awarded in a ceremony immediately following the stage, sometimes before trailing riders have finished the stage. Where a single rider leads in the competition for more than one jersey, they wear the most prestigious jersey to which they are entitled, and the second-placed rider in each of the other classifications becomes entitled to wear the corresponding jersey. For example, in the first week it is common for the overall classification (yellow jersey) and points (sprint) competition (green jersey) to be led by the same rider. In this case the leading rider will wear the yellow jersey and the rider placed second in the points competition will wear the green jersey. Not an actual jersey, a red number is given to and worn by the rider who a panelist of judges deemed the most aggressive bike racer the day before. While this is usually is given to the winner of the previous stage, it is not always, especially during a mass sprint. At the end of the tour an award is given to the rider who was thought to be the most agressive bike racer throughout the entire three week tour. The Tour's jersey colours have been adopted by other cycling stage races, and have thus come to have meaning within cycling generally, rather than solely in the context of the Tour. For example, the Tour of Britain has yellow, green, and polka-dot jerseys with the same meaning as in the Tour de France. The Giro d'Italia notably differs in awarding the overall leader a pink jersey, having been organized and sponsored by La Gazzetta dello Sport, an Italian sports daily newspaper with pink pages. Its King of the Mountains wears a green jersey. In an ordinary stage, all riders start simultaneously and share the road. The real start (départ réel) usually is some 2 to 5 km away from the starting point, and is announced by Jean-Marie Leblanc in the officials' car waving a white flag. Riders are permitted to touch (but not push or nudge) and to shelter behind each other, in slipstream . The latter is called drafting and is an essential technique. The one who crosses the finish line first wins. In the first week of the Tour, this usually leads to spectacular mass sprints. Often in the first week of the Tour there is a team time trial (TTT). Each member of the team who crosses the finish line ahead of or with the fifth (or last, if the team has less than five riders) member of the team is credited with the time of the fifth (last) team member to cross the finish line; this is the middle member of a nine-person team. Members who finish clearly behind the fifth member of their team receive their individual actual time for the stage. Traditionally, riders received the actual time recorded by the fifth member of their team in that stage. However, since the 2004 Tour, the only riders that necessarily receive actual time are those on the winning team; members on trailing teams (who finish ahead of or with the fifth member of their team) receive either the fifth member's actual time, or a computed time based on the winning team's time plus a penalty based on their team's placing in that stage, whichever is lower. The following table indicates the time penalty added to the winning team's time that a member finishing with his team will receive, according to his team's placing, if their actual time is greater than the winning team's time plus this penalty. For example, riders on a team that finished in 14th place, six minutes behind the winning team, would lose only two minutes and 20 seconds in the General Classification relative to the winners of the TTT. However, if they finished two minutes behind (still assuming 14th place), they would only lose the two minutes. If they finished in sixth place (still assuming two minutes behind the winning team), they would lose only one minute (per the table). Some people speculate that the motivation behind the TTT rule change was an attempt by the race organisers to "Lance-proof" the Tour, limiting how much time Lance Armstrong could gain in this stage. There is, however, no evidence that indicates this is true, and it is more reasonable to conclude that the new rules are simply designed to limit how much time any legitimate contender for the overall win could lose in the TTT stage due to being on a weak team (e.g. Jan Ullrich on Team Bianchi in the 2003). The particularly tough climb of Alpe d'Huez is a favourite, providing a stage finish in most Tours. In 2004, in another experiment, the mountain time trial ended at Alpe d'Huez. This seems less likely to be repeated, following complaints from the riders. Another famous mountain stage is the climb of the Mont Ventoux, often claimed to be the hardest climb in the Tour due to the harsh conditions there. The Tour usually features only one of these two climbs in a year. The Tour is immensely popular and important in France, not only as a sporting event but also as a matter of national identity and pride. Any Frenchman who has won the Tour becomes an object of public adoration in his native land. It is said that any rider who has worn the yellow jersey, even for a day, will never go hungry or thirsty again in France. Millions of spectators line the route every year to see the Tour first-hand, some of them having encamped a week in advance to get the best views. In the hours before the riders pass, a carnival atmosphere prevails. Any amateur rider or, in fact, just about anyone, is free to attempt the course on his bicycle in the morning, and after that there begins a garish cavalcade of advertising vehicles blaring music and tossing hats, souvenirs, sweets and free samples of all sorts. As word passes that the riders are approaching, the fans begin to encroach on the road until they are often just an arm’s length from the riders. The riders, unlike some of their fans, have traditionally tempered their competitiveness and enthusiasm with an elaborate but unwritten code of honor. Whenever reasonably possible, one allows a rider to lead the peloton when the race passes through his home village or on his birthday, and it often happens that the winner of the stage held on Bastille Day is French. One does not attack a leading rider who has suffered a mechanical breakdown or other misfortune, one who is eating in the feed zone or one who is enjoying un besoin naturel (roughly translated to a natural need, the practice of answering nature's call). Unless the final stage is a time trial--or in the case of Pedro Delgado attacking the yellow jersey of Stephen Roche in 1987 on the Champs-Elysées--riders generally do not launch attacks on the leader of the tour on the final stage, giving the leader one final day to bask in the glory of winning the yellow jersey. The lanterne rouge is the rider ranked last in the general classification, who may wind up in Paris with an overall time five or more hours longer than that of the winner. The rider may just be a lowly domestique, but such is the sympathy of the French public that finishing last is actually very prestigious. The money a rider can generate through publicity is much greater if he finishes last than second from last. Thus, in the past many riders have attempted to engineer themselves into last place by artificial means. Other riders may just be ill or slightly injured and unwillingly end up as the lanterne rouge. As the Tour becomes ever more international and commercial, it remains to be seen whether the customs of the past will continue to be observed. Much of the terminology used to describe the Tour de France is used in bicycle racing across the world. See the road bicycle racing article for more information on this. lanterne rouge - meaning "red lantern" (as found at the end of a rail train), the name for the overall last-place rider. See Culture and Customs. Note: Hyperlinked tour numbers point to more information on that particular tour. For previous tours this includes detailed results. For the upcoming tour, a route description is given. Lance Armstrong (United States) holds the record as the only rider to have won the Tour seven times (consecutively 1999–2005); he retired after the 2005 Tour. Gino Bartali holds the record of longest time span between titles, having earned his first and last Tour victories 10 years apart (in 1938 and 1948 respectively). 1910: Hors Categorie. French racer Adolphe Helière drowned at the Côte d'Azur during a rest day. The lightest was Leonardo Piepoli at 57 kg (126 lb or 8 stone 14 lb). The "average" rider in 2005 was 1.79 metres (5 ft 10 in) tall, weighed 71 kg (157 lb, 11 stone 3 lb), and had a resting heart rate of 50 beats per minute. Early tour riders have been said to have consumed alcohol and used ether among other substances as a means of dulling the agonizing pain of competing in endurance cycling. As time went by, riders began using substances as a means of increasing performance rather than dulling the senses, and organizing bodies such as the Tour and the International Cycling Union (UCI), as well as government bodies, enacted policies to combat this practice. On July 13, 1967, British cyclist Tom Simpson died climbing Mont Ventoux following excessive usage of amphetamines, probably complicated by the now defunct practice of limiting daily water intake to only four bidons, circa 2 litres. The 1998 Tour de France was perhaps the most scandal-ridden Tour in recent memory. On July 8, 1998, a major scandal erupted when French Customs arrested Willy Voet, one of the health assistants of the Festina cycling team, whose layer was Thibault de Montbrial, and whose lead competitor was Richard Virenque, for the possession of illegal quantities of prescription drugs and narcotics, including erythropoietin (EPO), growth hormones, testosterone and amphetamines. He later revealed many common practices of the cycling world in his book, Massacre à la Chaîne. In the 2000 criminal trial that ensued, it became apparent that the management of the Festina team had deliberately organized doping inside the team, including by hiring doctor Eric Rijkaert, because it was thought safer that way than if athletes were left to their own individual doping schemes, often applied without competent medical advice. It was argued that doping was generalized inside the cycling world, at least for racers who wanted to achieve major results. On July 23, 1998, French police forces acting on search warrants raided several teams in their hotels and found significant quantities of doping products in the hotel and cars of the TVM (cycling team) team. In response the riders started a "sit-down strike" and refused to ride, thereby putting millions of dollars of endorsements and advertising revenue in jeopardy. The Spanish teams quit the Tour in a show of solidarity led by the ONCE team. Richard Virenque denied doping himself and said that if he had been doped, it was not willfully, a stance which led him to be ridiculed. In 2000, he and the management of the Festina team were tried. During the trial, he confessed to doping himself. While Virenque was not sentenced (but had penalties imposed on him by sports authority), the management of Festina, the aides, the doctors, and some pharmacists were found guilty and handed down fines and suspended jail sentences. Just before the 2003 tour, Jesus Manzano, a Spanish rider, told a Madrid sports newspaper that he had been forced by his team, Kelme, to take banned substances during 2002's Centennial Tour in Spain. He also went into considerable technical detail about how riders avoid detection. His "reward" was to be banned from the 2004 Tour. In 2004 time trial World Champion David Millar was banned from the Tour because he was taken in for questioning by French police following up their discovery of banned drugs at the offices of Cofidis, his team. Millar is one of eight Cofidis members currently under investigation, implicated by the testimony of fellow rider Philippe Gaumont, who has told investigators and the press that doping with steroids, human growth hormones, EPO, and amphetamines is systematic on his team. Millar later admitted to doping, and has since offered his help in identifying the ways riders avoid testing positive in drug tests. A continued controversy also surrounds Lance Armstrong. In 2002 Filippo Simeoni told investigators about Dr. Michele Ferrari, a now-notorious sports physician who was being tried in the Italian province of Bologna for sporting fraud. Simeoni stated that Ferrari had developed a program for EPO use that would remain undetected. Armstrong had admitted to using Ferrari's services just before Simeoni's disclosure, leading to questions about Armstrong using EPO, although Simeoni said nothing of the sort. In response Armstrong stated that Simeoni was a compulsive liar, eventually leading to Simeoni suing him for defamation. On the 18th stage of the 2004 Tour, Armstrong broke free of the peloton and chased down a "break" that Simeoni was part of, agreeing to return to the pack only if Simeoni did as well. Simeoni agreed, and after the peloton caught up, Armstrong made "zipping the lips" gestures that many have interpreted as a threat to Simeoni to "shut up". Simeoni appears to be being ostracized by the riders on the tour, and it is unlikely he will ride professionally again. Other athletes have suggested that Armstrong's performances are unnatural without doping. 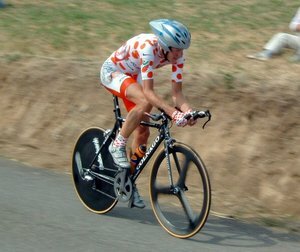 While he stopped short of accusing Armstrong of doping, Christophe Bassons (well known for being one of the few racers of the Festina team who did not take doping drugs, and a known opponent of doping) pointed out that Armstrong, while having several physical parameters similar to his, developed enormous power. It was also pointed out that Armstrong's breathing under effort seems unnatural, possibly suggesting the use of blood oxygenating products. Note that during his entire post-cancer career, Armstrong has been subject to blood testing after nearly every stage he has raced in the Tour, according to his autobiography, It's Not About the Bike. However, testimonies following the 1998 scandals have shown that the cycling world was considering moving to undetected substances, such as products with effects similar to EPO's but not generating higher hematocrit, thus the absence of positive tests is not conclusive. He once tested positive for a banned substance, however he explained after being detected that he had a medical prescription for saddle sore relief cream which had introduced those substances into his body chemistry. Insider sources contend that medical certificates authorizing the use of banned substances are one of the older tricks of the book. Professional cycling in general has a reputation for being one of the most doped sports. In particular there is continued controversy over the use of EPO, a hormone that increases the amount of red blood cells in the blood and thus offers increased cardiovascular endurance. Some claim that EPO use is almost universal. The UCI has done little to address these problems, taking a sort of "don't ask, don't tell" attitude, and running only a small and semi-voluntary drug testing program that is considered trivial to beat. The UCI appears to be too afraid to lose popular Tour riders, and would rather operate under continued controversy than lower participation. This fear is surfacing in other sports, as Major League Baseball and track and field have been dogged by steroid controversies as well in recent years. Furthermore, it is claimed that EPO is already passé and that other potent blood replacement products that do not increase the hematocrit rates are already in use in the cycling world. In 2004, the UCI introduced a somewhat more rigorous testing program, taking urine samples a few times during the race. However the samples were not tested for EPO, as the test was not ready for use and would not be until after the race completed. Although they intend to test the samples once the new test is ready, it is not clear what actions will be taken if the tests come back positive. The Tour Baby! - another film about The Tour, and a benefit for the Lance Armstrong Foundation.